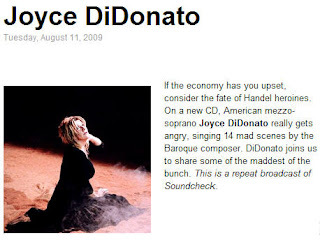 Joyce DiDonato, one of my favorite mezzos who just happens to blog as the Yankee Diva , released her new album Furore back in January. Yesterday, WNYC's Soundcheck aired a repeat broadcast of John Schaefer's conversation with Joyce. Give it a listen and don't forget to buy this incredible album of Handel mad scene arias.